Construction is a robust sector, literally and metaphorically, and we have overcome many challenges before. I can only imagine that this is why we’ve never reached a pain threshold that compels us, as a united sector, to tackle the skills gap. I’m no economist, but rumours of a post-Brexit mini recession (source: Construction News, 27/7/2016) do suggest it is so important that we take responsibility for the skills gap – each and every one of us – right now. Complaining about the skills shortage is easy (and a definitive sign that we still haven’t yet reached an adequate pain point), and the barriers to action are real and significant – shortage of time, resources, staff turnover, and capacity to name a few. On the face of it, that doesn’t even make it sound like a very appealing sector to join. In fact from 2013 to 2014, favourability of the industry fell for both parents and young people (source: CITB). Nevertheless, results from CITB’s review of the Young Apprentice Programme indicate that only 10% of construction employers had engaged with schools for career-related activities. 10%! No wonder children don’t consider construction to be worth their time (34.6% in 2014, down from 38.2% in 2013). 75% of construction employers found young people lacked understanding of the construction sector, and 82% of teachers didn’t feel that they had the appropriate knowledge to advise pupils on their careers (source: IFF 2015). I don’t think it would be too much of a leap to suggest that those statistics are related. We are perpetuating the cycle of poor awareness and low desirability, and possibly even increasing the damage by presenting a disjointed, patchy, sporadic, siloed sector. Could this all be because construction has traditionally been a male-dominated sector? We all know that male traits lean towards competition rather than collaboration. Yet collaboration is still the buzzword at every event, roundtable, networking breakfast and press briefing. Perhaps we’re just making the concept of ‘collaborating’ really hard on ourselves. Or we’re waiting for someone else to collaborate for us? Naturally, all this is important as the skills gap has an impact on our existing requirement to build (particularly housing), but it also has a massive impact on each and every one of us as individuals – the homes we live in, the buildings we work in, the infrastructure we rely on – and at a socio-economic level, with the prevalence of anti-social behaviour, disconnected communities, and low-level mental health conditions. So, I suggest we collaborate on finding ways to collaborate. Think about the resources and skills you have in your own organisation. It could be a good-sized meeting room. Or PPE in lots of different sizes. Or transport, or access to site equipment, or software licenses, or demonstration facilities, or strong social media channels, or enthused staff. Or something completely different. Now pick up the phone or draft an email to someone else in your supply chain and ask them what kind of problems they face in trying to engage with education. Then talk to people involved in addressing the skills gap alongside education, as they’ll be able to help you navigate around those problems. (It’s what we do, and we’re a great source of advice!) And together you can come up with powerful ways to support each other, create more consistent engagement, and fill some of those outreach gaps. Once you’re taking collaborative action, you might want to introduce some metrics to measure the effectiveness of your efforts. It could even be that someone else in your supply chain is a wizard with metrics – what a great way to get them involved and increase the collaboration! If you’re not involved in addressing the skills gap as an individual, I urge you to take action. Talk to your colleagues, discuss ways forward and be part of the solution. If its something your company already does, that’s great too, but what are you doing personally? At the risk of sounding like a cliché, if you’re not part of the solution you are part of the problem. 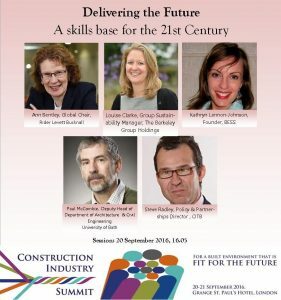 Nobody is going to do this for us and now more than ever the impact of the skills gap will be felt across construction. And when you arrive at the Grange St Paul’s Hotel for the Construction Industry Summit in September, and you’re ready to work the room, perhaps consider using this practical collaboration approach as an ice-breaker. I will be speaking at the Construction Industry Summit as part of the Delivering the Future’ Session. Who Has the Time to be Nice? 19th October 2015 kathryn@BESS Comments Off on Who Has the Time to be Nice?